Ex-Commission boss Jose Manuel Barroso has allegedly been caught lobbying his old institution for his new employers, Goldman Sachs, despite pledging not to when he accepted the cushy new job. It was EU jobs n’ growth Commissioner Jyrki Katainen who confirmed that he had met with Juncker’s predecessor, in a meeting where trade and defence matters were the topics of choice. Thanks to a freedom of information request, the ex-Finnish PM revealed that he met with Barroso, alone, for the first and only time in October. It’s commendable that the Commission now has checks and measures in place that mean the Barroso meeting wasn’t totally swept under the rug. But why did Katainen agree to meet in the first place? Even if it wasn’t actually ‘lobbying’, it certainly looks like it. 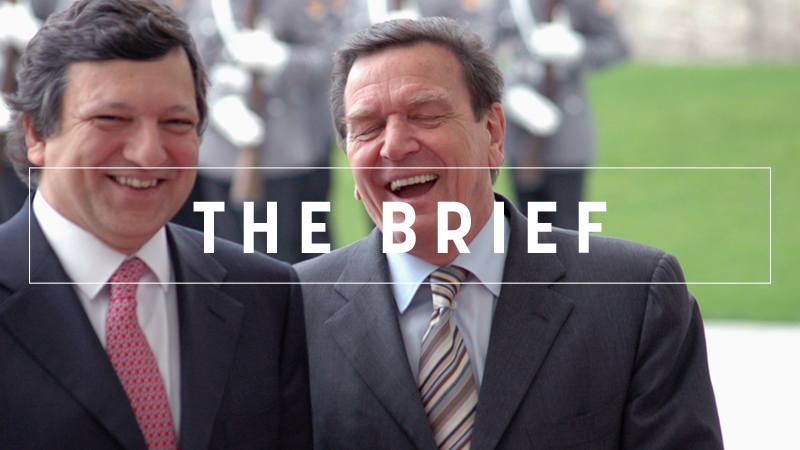 The Berlaymont’s ethics committee signed off on Barroso’s new job because it was in line with the rules at the time. Think what you like about that decision but the Commission can only act within the law. Now the ex-president has reneged on his ‘no lobbying’ promise, that approval might be in doubt. But the best thing Katainen could have done when Barroso got him on the phone to arrange the meeting was to have simply said ‘no thanks’. Juncker’s pledge to extend the “cooling-off” period from 18 months to three years for former Commission presidents was made good last month but that doesn’t mean EU officials shouldn’t use a bit of common sense now and then. It should’ve been obvious to an experienced politician like Katainen that the meeting would a) be noticed by someone, and b) seem like very poor judgement on his part, even though it was, seemingly, above board. After all, something doesn’t have to be illegal to leave an acrid taste in the mouth. Former German Chancellor Gerhard Schröder’s involvement with the controversial Nord Stream 2 pipeline and Russian energy giant Gazprom is a case in point. Little episodes like this set back trust in the big-blue-EU-machine every time they come out. The most infuriating thing is that they are totally avoidable. Fighting anti-EU rhetoric by busting bendy banana myths is fruitless if Commissioners are needlessly meeting up with people like Barroso. It throws fuel on the populism fire and creates problems ad nauseam. Ombudswoman Emily O’Reilly is already on the case and, after recently coming up with the best ideas on how to make the EU better, will soon issue her own findings. If flaws are found in the revolving door system, then guilty parties could see their pensions frozen. But maybe no matter how many codes of conduct are written or warnings issued, ‘common’ sense might still remain a precious commodity in the EU bubble. Spanish Economy Minister Luis de Guindos is vice-president-elect of the European Central Bank, marking the return of Spain to top EU posts. EU leaders are expected to crown him during the March summit. Several Turkish citizens, among them civil servants and judges who claim to be at risk of persecution by Turkish President Erdogan, have been rescued by the Greek coastguard and asked for asylum. Logging of ancient woodland in Poland infringes EU law, the European Court of Justice has confirmed, paving the way for penalties against Warsaw and prolonging its spat with Brussels. Although the Commission views transnational company agreements made within European multinationals as an innovative tool for cooperation, it has yet to define a legal framework for them. Europe could pursue a more ambitious renewable energy target for 2030 and still keep costs affordable, according to a new Commission-backed study. Private companies have offered to environmentally upgrade and economically “save” a coal power plant that is about to shut, as it falls foul of the EU’s CO2 emission standards. The European Covenant of Mayors has mobilised thousands of local governments to voluntarily implement EU climate and energy objectives. It should become a key instrument for the future EU budget, urge local and regional leaders. At least Jyrki Katainen has the right idea when it comes to plastic waste. He challenged the Parliament to follow the Commission in removing plastic bottles from their premises. Why not join in with #PlasticFreeFriday? You won’t miss it once you start kicking the habit. MEPs decide on the future of Europe’s electricity market and vote on a Commission list of priority energy projects that has been criticised for being too heavily geared towards fossil fuels. Watch it all live here from 10am.